It was time for me to go. It was time for her to grow. This morning has been coming for months. She’ll be 7 in December. She had to start 1st grade sometime and sometime was this morning. First grade is different somehow. Kindergarten is a separate issue altogether. When the numbered grades start, the clock starts. Today was 1. In twelve years, it’ll be done. At breakfast, she was so excited. Anticipation was palpable. She had her new outfit, chosen for the first day of school, new backpack, new shoes, new everything. All I could see was my little one. 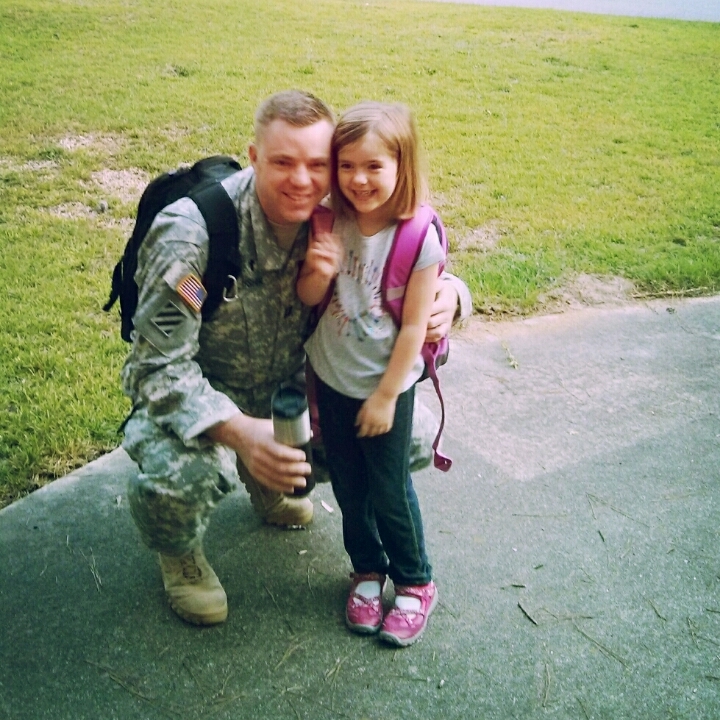 My little girl I left as an infant on that second deployment. The little toddler I came home to. My oldest. My little that could now read and sing and reason. My pride. We took pictures and off we went. The process for this school is that everyone gathers in the school cafeteria and then the teachers take the students off to their assigned classroom. I walked her into the school, down the hallway and into a crowded cafeteria. I expected to hand her off to another adult but its 1st grade and she needed to do this on her own. I shook hands with a teacher who showed her where to sit. She didn’t need me to stay. I like Musicals. Always have. We went to watch Frozen the other day. We then bought the soundtrack. Its been playing almost as much as Christmas music in our house for the last three days. I would say that I’m a great parent and willing to listen to my kids favorite music but that would not be accurate. I will own that when I was at work yesterday, I wrote a memorandum whilst “Let It Go” blasted from my computer speakers. I love that song. I love that Sophie loves that song. Maybe its the prison. I looked at her big eyes and had this vision of her growing up. I’m getting old and my kids are growing up. Christmas Eve 9 years ago, I met Sara for real. We talked till Christmas Day. Now we have three children, survived two deployments, have lived in 7 different cities, and still in love. It’s a different love. A resilient love born of adversity. The best kind. There is this strange power that one of the sisters has. It comes out when she has strong feelings. Fear, anger etc. Her well-meaning parents, acting on the information they have, keep her hidden away, avoiding anything that would trigger emotions. They teach her to control her power by suppressing it. What a metaphor for suppressing anger, pain, and other emotions! Her power is uncontrollable and dangerous because she never learned to manage it. I resonate strongly with this. Much of my pastoral care is helping people integrate suppressed emotions into their present in a healthy way. When we suppress stuff, its going to come out and if we don’t learn to experience our emotions in a healthy way, explosions are the natural consequence. The energy has to go somewhere! Redemption comes in the story as the queen learns to experience both the positive and negative sides of her power in a healthy way. Everybody benefits. I love it. 4. Field Trip Day – does it really need an explanation? Best Warrior Competition by my son. Who is three. And awesome. I quizzed my son (who is three going on 4) today about who would win if they fought a battle. Who is the best warrior ever?? I looked up from mowing the lawn and my three year old son was standing on the side of the road. A busy road. We live on the top end of a blind turn coming up hill. There is no shoulder. My son stood on the sliver of gravel between the blacktop and the overgrown grass by the ditch that runs between the driveway and the blacktop. I yelled. I hollered over the lawn mower so in reality it was more of a scream. He looked up. I could see the confusion in his eyes. It has been noted the men use the word “confusion” where there are deeper, more significant, undesirable emotions that want to be said but we are not at a place to say them. I realized that I was screaming over the mower which was still running. I let go and shouted a warning to my son, “Stay where you are at, don’t move! !” I ran to him. Not realizing until later that I was running down the road in the middle of it between any unsuspecting drivers and my boy. I reached him in seconds that seemed like minutes. Dangerous minutes. We live down a hill. We have a “back yard” at the bottom of the hill and a “top yard” by the road behind a fence. There is one, unmovable rule about the top yard, you can’t go past the fence. Ever. Never ever. The road is too busy. I took him by the hand and we walked briskly back down the driveway. He looked up at me and there were tears. Sudden, immediate, big tears rolling down his little, red cheeks. The angry, scared, hurt cry followed. I hugged him to my chest, tears in my own eyes. I was so scared. So afraid of what might have been. He was scared. Scared of his daddy who had yelled so loud, so angrily. I held him until he was done crying and my heart was done racing. It took a minute. After trudging through the woods investigating some dragon tracks we found, the relationship was restored and all was well with the world. Its like that with God sometimes. We experience the Divine yelling, screaming for us to get out of the way. Move. Stop doing what we are doing – because its hurting us and hurting God. Fear not. All is well. Just get out of the road. Move away from the danger. Let God hold you close. It’ll be ok. All is well. So, Tuesday morning, I took my children to school for the first time. Sophie, my four year old, went right to her class. She sat in her chair nervously looking around the room clearly filled with the excitement of this new thing in her life. Ransom, my three year old, was much more apprehensive about the whole thing. While he was very down with the dinosaurs and the puzzles, he clearly was not ready for mom and dad to leave the room. Mom and dad however, were filled with the conflicting emotions of being excited for the kids to have reached that first big pinnacle of childhood and the grief that they were growing up and out of the home. On the one hand I found myself immensely proud of my children for doing well in school and some latent fear of what impact setting my children out in the world would have on them. As I walked out of the school in the morning, hand in hand with Sara, my thoughts moved toward the reality that it has happened – life will never be what it was yesterday – our children were now under the influence of others. Only time will tell how we do and have done as parents. Change often brings conflicting emotions. How do you deal with them? How does one deal with the reality of change and the desire to keep things the same, the comfortable way one has always known? I think one of the secret is a constant evaluation of the current situation. Self awareness, family awareness. Is it the best way? Am I hanging on to this way of doing things because I’m comfortable with it or because it really is the best way of doing whatever it is I’m doing? I can only trust that where we’ve been has strengthened us for where we are going.